I’m going to bare my soul in this post, so be prepared. And by that, I mean finding typographical errors in your own work AFTER it’s been published. As an indie author, this has been my worst lesson ever. Typos happen. Typos happen. And the reason I’m repeating that with emphasis is because I’m a perfectionist by nature and have had to learn how to live with myself because they do happen. Ways to live with yourself if you find typos in your work. 1. Understand the human brain. Could you understand it? 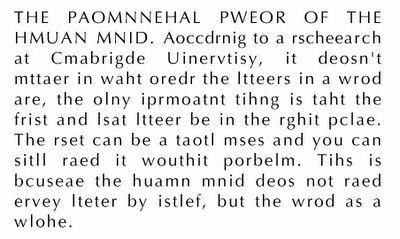 I suppose it’s sort of nice of our brains to compensate for errors/typos like this when we’re reading, but it’s really quite horrible for editing and revising. As a writer, I have the most terrible time finding typos in my own work. Give me someone else’s work and if asked, I can proofread it and find typos like a champ. But if someone holds up a page and points to a typo in a sentence that I wrote, I will stare at it for an eternity without ever seeing the typo unless they explain what I’m supposed to be seeing. All because of my brain filling in what it already “knows” is supposed to be there. Thanks a lot, brain… Okay, moving on. Okay, so we have brains. And we’re only human. Here are some fun examples of typos that are undoubtedly excruciating to think about for the authors in question. The first three have become “famous typos” because of their humorous nature. “He stiffened for a moment but then she felt his muscles loosen as he sh*tted on the ground.” (corrected to “shifted on the ground,” but not until many people had already purchased it from iTunes). Obviously I meant to write, “He could be a radio announcer. Or a horror actor.” I certainly did not mean to imply that this individual could either be a radio announcer or somehow shrink himself down to live inside a horror actor like some sort of alien spawn. Because of the way the brain works, this is true MOST of the time. The free ARCs (Advance Reader Copies) that I gave to reviewers had typos, and when I shipped them out, I explained in most humble and shamed tones that there would be typos in them. Some of my reviewers caught them. But some of them told me that they didn’t see any of them! Either way, most reviewers/readers will focus on the story. But there are those who will examine every single word and may comment on editorial errors in their review. Confession time: I have a short list of other typos that made it into my book. A LIST. MORE. THAN. ONE. TYPO. And I’ve just recently done what any perfectionist would do. I stared at the list and beat my head against the wall. I cried for an hour. But then I went back to my original files and fixed all of them, paid a terribly expensive fee to my ebook editor to fix all of the typos in the ebook files, and I resubmitted my print files to CreateSpace. I could have left them in there but decided that it would be better in the long run to kill those typos, KILL THEM DEAD, before they tormented me for my entire life. I’m coming after you, TYPOS! Unfortunately, I didn’t catch/fix all of the typos before I did a huge free promo at the beginning of the month and >1,000 copies of my book got downloaded. *sighs* So if you have a copy of my book, you MAY have an edition with typos. Hang onto it because they will soon be out of circulation and worth millions relative to the corrected edition out there (slight very large exaggeration). So, advice to all authors: Please don’t kill yourself over typos. Please don’t beat your head on the wall or lose sleep over them like I’ve done. But of course, you should take the greatest efforts to try to eradicate them before they multiply while you’re asleep (they kind of have a way of doing that). Don’t fool yourself into thinking that “spellcheck” is omniscient. Read your book out loud. Get an editor to help. I did all of these things, but in the end, it was my mother-in-law who gave me the list of typos that she caught. Because mother-in-laws are good at coming over and finding all of the dust that you didn’t see in your house before you invited guests over. No, seriously, she found them because she is one of my biggest fans, bought both print and Kindle editions of my book, and has read both versions probably 10 times. And because she happens to have a background in proofing legal briefs. I think I might hire her as my editor next time. Just to look for typos. I should probably mention that this isn't just an issue with indie writing. All writers and editors have “only human brains.” Darned brains. It's so annoying isn't it when you've read your work 100 times and not spotted anything wrong and then someone says, “didn't you see this?” SCREAM! YES. SO frustrating. Thankfully other writers seem to empathize with this issue. Unfortunately, I think some readers find a sort of enjoyment in pointing out mistakes. But honestly, I'm glad someone came out and told me (even though it also made me want to SCREAM when I initially saw THE LIST) so I could fix things. I feel your pain. Small press has same problem. I tell people I left them on purpose and when they find one they win a boobie prize. Great idea! 🙂 I saw a very kind way of putting it in The Huffington Post once – they equated typos to being something like a beauty mark on a book. A very human mark for all the world to see. Fantastic post – made me laugh. I have yet to get to the publishing stage, but, yes, typos annoy me to no end in indie books! (And I'm so very guilty of them – especially when publishing my blog too fast). We need to band together, against them (TYPOS, I mean). Great post – and I use a copy editor – I know I can't see typos when they's staring me in the face! Well done for putting this up, really good, it makes me sick to my stomach when I find them in my work after having convinced myself of perfection! !I suppose the bottom line is always get your book proofread before publishing. Fight the TYPO!!! Great advice. We can often be our own worst critic. Sometimes you just have to say “what the heck” and move on. If the story is engaging the reader will forgive a type. Best of luck with your novel. Thanks, Ksenia. They are evil little buggers. I had an editor look at my drafts line-by-line for typos and we both missed a few. But I'm not going to beat myself up over it anymore. Plus, I finally chased them down with my Xena torch and hopefully extinguished them once and for all. Or did I…. Thank you, Jo. It's really amazing/terrible, isn't it? I've read sections out loud and missed them! Thanks, Bill! I know that sick-to-my-stomach feeling all too well. We just need to keep trying different things to fight the typo. Editors help, but then they can make mistakes, too. Helen, thank you for the lovely laugh. I was just fretting about my first book, thought I'd got all the typos…and there are, ahem, more than a few. Most people have been ok about it but one was a bit sniffy today, and I'm such a worry wort about these things. I'm normally a bit of a pedant about checking, and I thought I had been with my ms., …I actually have a sneaking suspicion that I may have sent the wrong file in! I only gave the proof a cursory glance, thinking everything was pretty much spot on! Argh! I have a friend who has proofed it properly now, and I will be doing a revised edition in a few months. It's funny though, on the subject of typos…I am noticing a heck of a lot more errors in 'pro' books these days too!